The alien Tosk exploring the ship. Tosk: You sleep a full third of your rotation. You rest and relax while you are awake. Alpha Quadrant has far too much down time. This episode asks a fascinating question — what happens if people come from the other side of the wormhole? By accident? Completely ignorant of the Alpha quadrant? Even a space station gets to explore brave new worlds. This is the DS9 best show opener ever so far. I love the look and charm of the Dabo girl. I love the jibe about the Ferengi knuckles. I love it actually being in the damned contract. The humor in this show is a reflection of its grittier realism. It just kind of situates DS9 in a way few other things do. If you question that, try to picture one of Guinan's bartenders complaining about contractual sexual harassment. But the interlude is broken by wormhole sounds. O'Brien is in some ways a logical choice to lead a first contact with–the Enterprise as the Federation flagship has come in touch with many first species, and his expertise would come in handy both this way and as an engineer. But still, especially after "Babel," I'm wondering why he doesn't have a buddy system set up–Odo perhaps, or Kira. Not enough staff? O'Brien meets with Sisko while our alien-of-the-week, Tosk, looks for weapons with the room computer; our engineer shows he's canny and a good assessor. Yep, this Tosk is acting like a spy on the run. Maybe he'll wind up the replacement Dabo girl. Or maybe he needs those weapons to save someone. 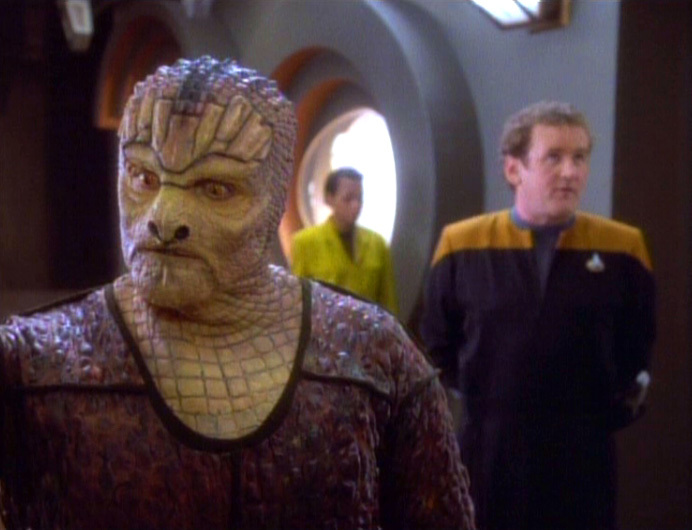 But something's up... and I'm worried that O'Brien's being compromised, especially when we see how depressed he is when Tosk is locked up for spy-like activities. Even Quark notices O'Brien's lonely. When the wormhole opens again, I, like O'Brien, am ready for answers. Tosk turns out to be a hunted hero of his race trying to survive; bred and trained for battle, it's his role to be better than everyone else in his society–and to prove it by being perpetually hunted, and perpetually winning. The aliens show no interest in the stable wormhole, in the new alien societies, only in their hunt: and their punishment for Tosk being captured alive is of the heavily nasty sort. So what's O'Brien to do? When the Irishman has a problem, he goes to the bar. It's almost stereotypical. But I love O'Brien's solution. Maybe it's the talent of the actor, but by the end, I was ignoring the whole bad-costume thing for Tosk, and he was coming across as realistic, maybe even noble. I think Sisko was secretly glad O'Brien found a way. At times I found the aliens fakely cheesy and the plot simplistic and ineffective. At other times I was all GO GO GO. Overall, I think O'Brien's solution was FAR more elegantly in line with the Prime Directive than just interfering with the hunt and handing over Tosk. And the ending is perfect. O'Brien deserved to be bawled out by Sisko. 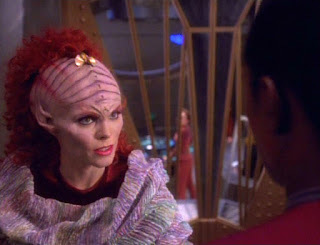 But (just as with Kira a few episodes ago in "Past Prologue") Sisko's left an opening to know that they have his support–and O'Brien is smart enough to see it. We get another Sisko Smile as the episode fades to black - never a bad thing. In the end, though, I think this is a growing-pains episode for the show: TOS and TNG used this type of plot to great success. It worked because the show and the ship could leave the environment. But can Tosk and his race just vanish from the Gamma Quadrant? A stable wormhole requires new plots, or at least new approaches to old plots. Why is O'Brien going onto a strange ship alone? I know they have sensors, but seriously, they need a buddy system, especially after what happened in "Babel." In some ways, I answer my own question, above, but still. The blue alien woman who cheated at Dabo looks sort of familiar. Haven't we seen her before? The captioning on Netflix renders the alien's pronunciation "O" BRIEN, which I thought was cute. As usual, Armin Shimerman steals almost every scene he's in. Whether he's trying to comfort O'Brien, or just a line in a contract, he rules. Miss Sarda: I'm not what a lot of people think. I mean, if you're a dabo girl, you know, you get a reputation. Tosk: How many live here? O'Brien: Well, three hundred, more or less. Tosk: What is its purpose? O'Brien: Well, sometimes when I walk along here I feel like we're the flea market of the sector. Tosk: Yes! The arva nodes convert space matter into fuel. O'Brien: Ah, got you. Piece of cake. Tosk: Piece of cake. Ramscoop. Arva Nodes. O'Brien: A piece of cake. It's an old human expression. It means they'll be easy to fix. Tosk: They will be easy to fix? O'Brien: Sure. We'll just get my crew to remove your Arva Nodes, then we'll take them over to the replicator center and make new ones. 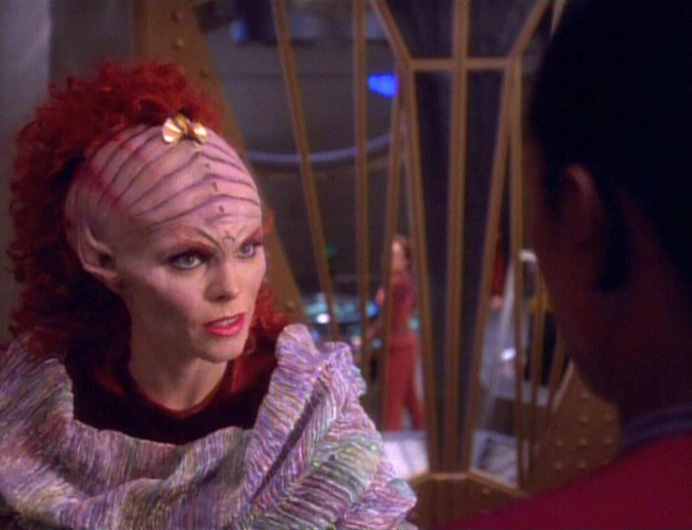 Tosk: We are very different, Tosk and O'Brien. O'Brien: I've noticed. Hey, barkeep! Quark: Don't call me barkeep. I'm not a barkeep. I'm your host, the proprietor. A sympathetic ear to the wretched souls who pass through these portals. O'Brien: And a man who will exploit any vice you may have. Two synthales, barkeep. Tosk: I am sorry. I have no vices for you to exploit. Hunter: Have you nothing similar in your own society? Sisko: Centuries ago, people on my world engaged in bloodsports, killing lower species for pleasure. A few cultures still do. But even they wouldn't consider hunting a sentient being. Hunter: But he is sentient only because we have made him sentient. He has been bred for the hunt. His entire reason to exist is the hunt. To make it as exciting, as interesting, as he can. Obviously, you do not comprehend. Sisko: I comprehend just fine. I have no tolerance for the abuse of any lifeform. I always enjoyed this one as an early standalone, it was an interesting story about cultural differences, the value placed on a life, how far the Federation should go to impose its ethics on another civilization, etc. And I liked that in the end, O'Brien gave both visiting parties what they really wanted anyway, for the hunt to go on. Once again, Sisko finds a way to split the proverbial baby in half when one of his officers does something wrong yet understandable. I think that's one of Sisko's signature traits on the show over the years, his flexibility with Starfleet regulations compared to someone like a Picard. I think it adds to the frontier atmosphere of the show(at least the early seasons), how out there farther away from regular Starfleet they kinda have to solve their own problems. Perhaps the Founders took the Tosk DNA and re-engineered it for their own purposes. I actually really, really enjoyed this one. My heart simply broke for Tosk once he was captured and sentenced to be brought home alive. Yes, his costume and makeup was a bit rough, but he was just so dignified and noble. Excellent actor underneath all of that. This may have been the first time I actually liked Quark. Also, props for DS9 for having the opening be about sexual harassment, even if it got dropped when the wormhole opened.